Lasers have become an increasingly useful tool in conventional dental practice. Their precision and less invasive quality make them an attractive technology in esthetic and pediatric dentistry, oral medicine, and a range of other dental procedures. 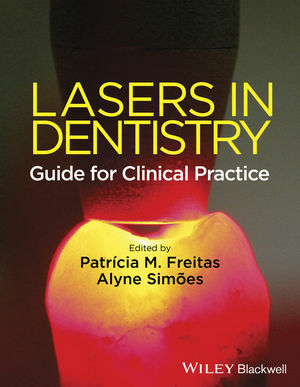 Lasers in Dentistry: Guide for Clinical Practice is a comprehensive, yet concise and easy-to-use guide to integrating lasers into conventional clinical practice. The book begins by providing the reader a thorough understanding of how lasers work and their varied effects on oral tissues. Subsequent chapters are organized by procedure type, illustrating common clinical techniques with step-by-step illustrations and case examples. In addition, each chapter provides an overview of the latest research for use in clinical practice. More comprehensive than at atlas yet practical and clinically oriented in its approach, Lasers in Dentistry is an essential tool for practitioners and students looking to broader their skill set in laser dentistry. Patrícia M. Freitas, DDS, PhD, is Associate Professor and Vice Chairman of the Special Laboratory of Lasers in Dentistry at the University of São Paulo in Brazil. She holds positions in the World Federation of Lasers in Dentistry and the Brazilian Association of Lasers in Dentistry, and lectures internationally on various topics in laser dentistry. Alyne Simões, DDS, PhD, is Professor of the Faculty of Dentistry at the University of São Paulo in Brazil. Her work focuses on laser dentistry, LED and PDT in the treatment of oral mucositis, salivary gland hypofunction by chemotherapy and diabetes, and the effect of laser therapy in oral and systemic changes arising from these conditions.